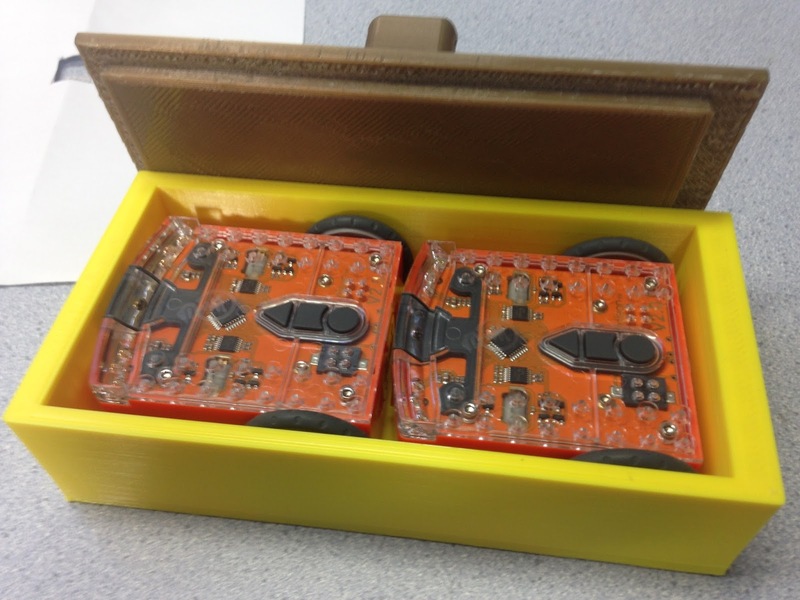 Previously we created speakers for 3D Printing that were a major project in 2015. These speakers required 100 hours or so of 3D Printing to print the feet, handle and speaker covers. For 2017 our students project was to produce these speakers as described below: the intention is the speakers will integrate some form of 3D printing accessories but students at present have laser cut the speaker from wood. Rico Explains the Tech at Auroa Primary School - Speakers 2017 from myles webb on Vimeo. This video is a staff member who created an original Pinball table which was themed by the school with the voices and images of staff members. This is a personal project that he created on his own which he decided to share with the school, with the school looking to eventually have the students develop their own version of this table featuring themselves. PinballDetails from myles webb on Vimeo. 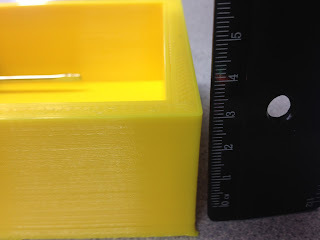 Challenge: Student had designed the previous print in this series as a stand/box for an Edison Robot, his original design featured a single compartment for the batteries and the coding cord, and the robot itself was too big to fit into the box. These issues were intended to be addressed in this improvement. 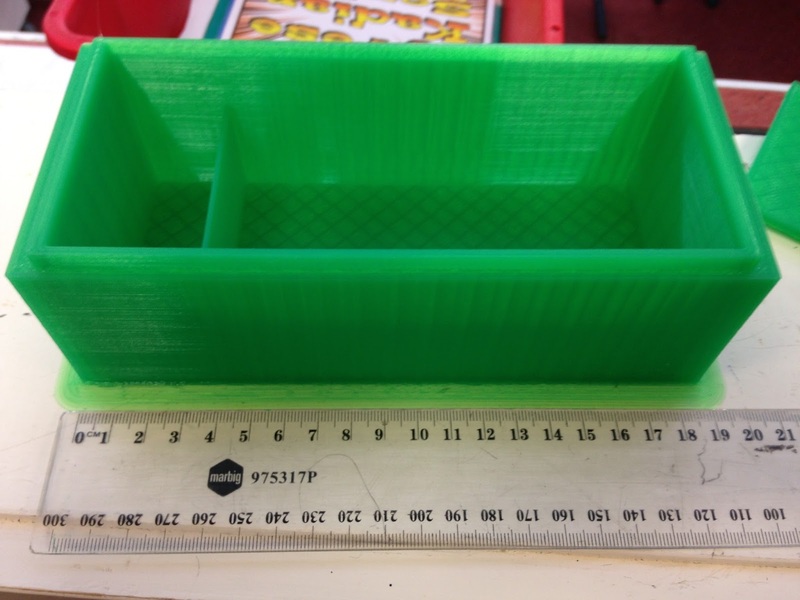 Background: Following feedback from staff over the first print the student was challenged to make improvements on the design to make it more user friendly. Level of Difficulty: Medium - this is an update of a previous print that has worked, but this student is making adjustments with the intention of making improvements. The original design had a combined battery and cord space and he wanted to seperate the two into distinct areas. In the first print/design this area was a combined space and the robot was not able to fit into the space so it was tilted, the student was looking at a way of stacking multiple robots in a space with all thier equipment. 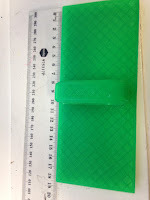 Size: Length 16cm, width 10cm and a height of 3cm for the sides. Timeframe: Seven hours to print (8mm nozzle). 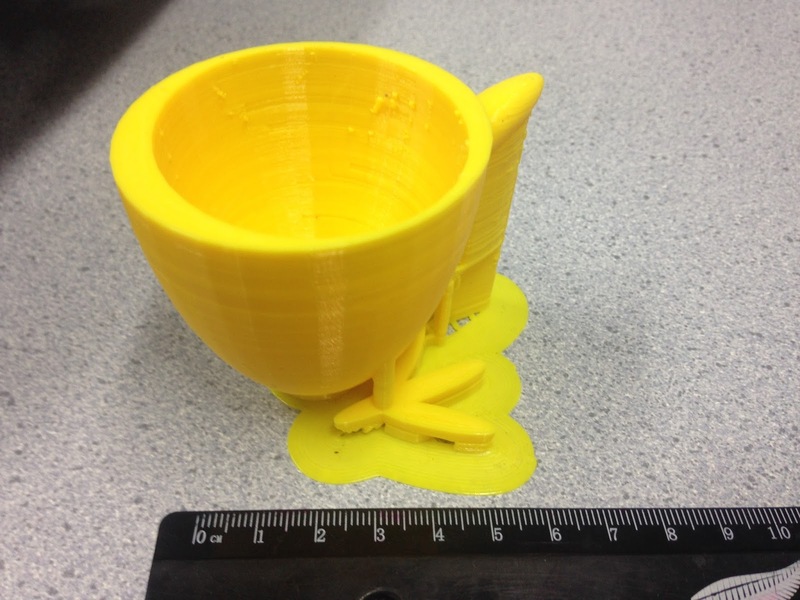 Process: Unsatisfied with the original design the student modified it in Tinkercad to make the changes that he thought was required. What we would do differently: Although it isn't perhaps obvious from viewing the photographs supplied the batteries were originally intended to be standing up in the space above occupied by the connection wire - however this space was only able to have three batteries standing in the area vertically which was the intention. 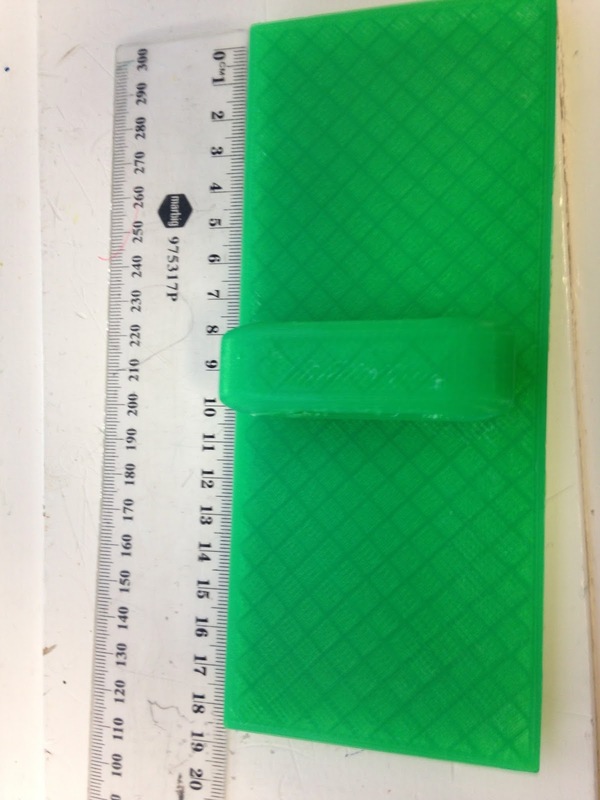 The student has indicated that he can make improvements and will redesign the print accordingly. 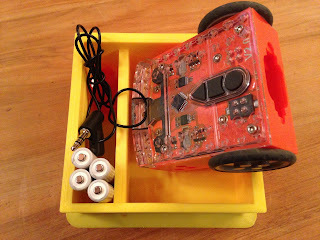 He has been asked to think about ways in which multiple robots can be stored and the boxes linked together and also the possibilities of individualising each box for ease of location of specific robots (as we currently have a dozen at our school). Edison Robot in storage with additional items. Challenge: The Edison Robot comes as a low cost pre-programmed Robot for use in the classroom/education. The emphasis on packaging is minimal so when the device is unboxed it is ready for use. It also comes with additional items that are required to run it, batteries and a headphone set. 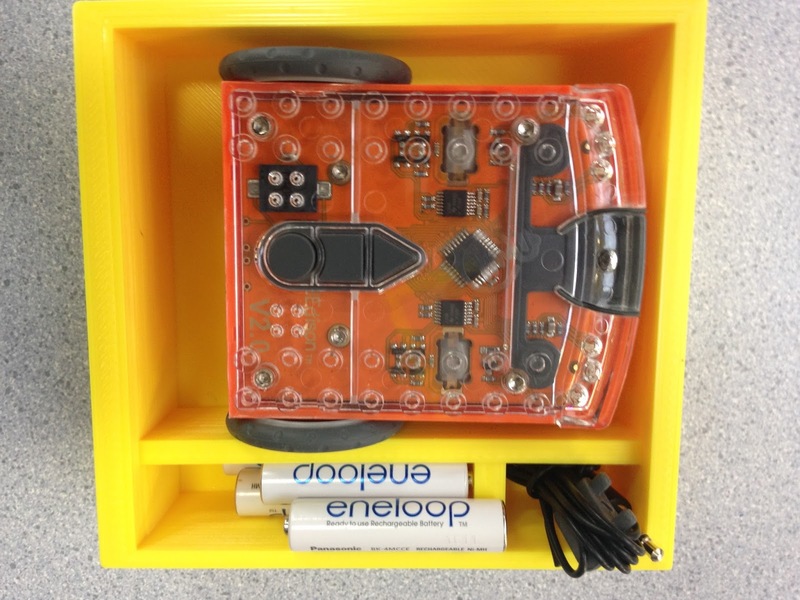 The idea behind this design was to introduce a storage space for the Edison Robot where these additional items (and the robot) could be cleanly stored when not it use. Background: Student had previously designed low level design and was looking to extend himself with something more creative and unique. 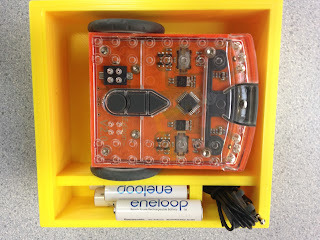 The school has a set of thirteen of these robots all of which have additional items that are required for them to run, the teacher concerned thought that the idea itself was excellent and would really help the storage of these robots. Level of Difficulty: Low-Medium, the design itself was straightforward consisting of basic and common shapes with a divider in between (as shown above). However the student already has ideas to increase the complexity of the design based on the prototype that has been printed. Size: As shown a length of 15cm a height of 10cm and a depth of 3cm. Process: Tinkercad, main interface then into Cura and then printed on an Ultimaker 2+. 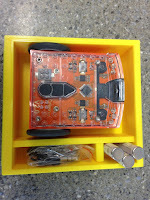 What we would do differently: This was the first design and the idea was essentially a prototype, the student as the print run was being completed was already considering alterations to the design, either increasing the size of the space for the Edison, which at present in slightly smaller than the robot, as shown above. 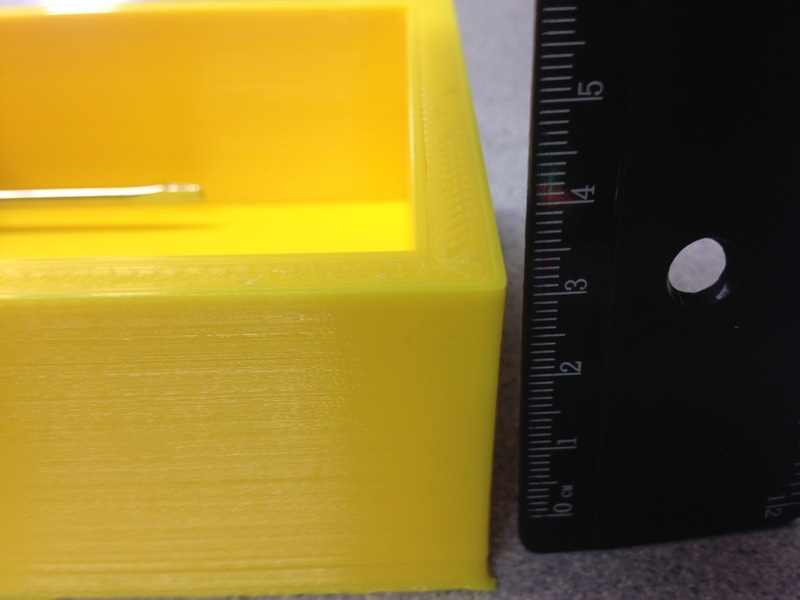 The other consideration is to raise the depth of the sides of the box which currently are 3cm. 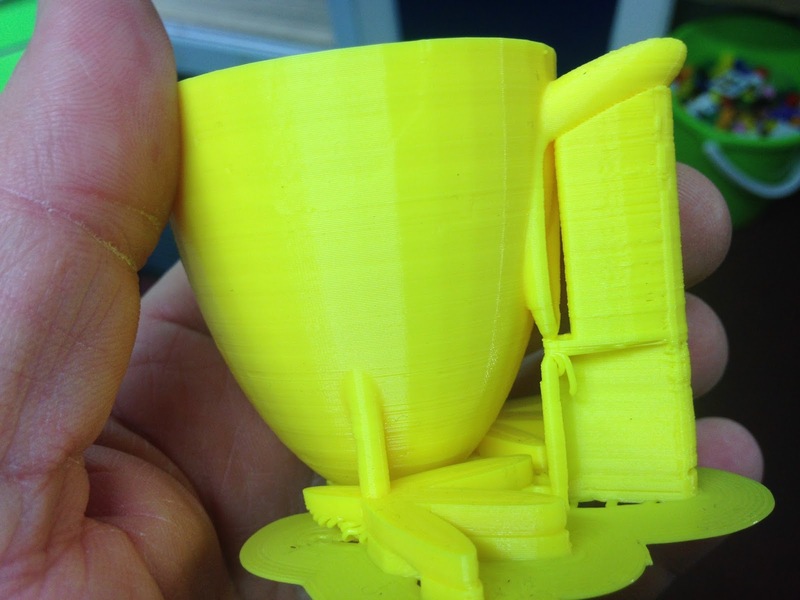 Challenge - Student was interested in creating a practical 3D Print that would have a regular use. She enjoys eating eggs for breakfast and had seen the previous design of a Egg Cup. She believed that she could improve on the design, and did so using the basic Tinkercad design interface. Background: We encourage students at our school and in our class to create original designs that are practical and original. If a design meets this brief then we take an opportunity to print it. Level of Difficulty: Medium - this was designed from the basic Tinkercad Interface of which the chicken feet and beak are basic designs. There was innovation with the hollowing out process and the sizing of the design. Size: Width of 6cm, length of 6cm and a height of 6cm. Timeframe: The print took five hours - the difference that this has made, the original design in this series was a nine hour print (both with a 8mm nozzle). This was a more compact design as the original had wings and an extended beak etc. Process: Most of the key features of this design were created using the basic interface options available on Tinkercad. It was the students first original design for a Y6 (11 year old student) and as a consquence the student wanted to keep the design simple to ensure it was successful. As per most designs here it was a process involving Tinkercad/Cura and then printing on an Ultimaker 2+. What we would do differently: Nothing. The design was a considerable improvement on the original, it was more practical, had better balance and served a better purpose. The student was thrilled with the result and it would be considered an extremely successful print.